Norbert Ostrowski began designing cars during the golden age of the American automobile. For 30 years, he worked in the styling departments of Detroit’s iconic brands: Chrysler, General Motors, AMC. But his sketches no longer exist. Like most of the early-stage artwork created by America’s auto designers, they’ve been destroyed. Another art collector is Robert Edwards. The lifelong car enthusiast has curated the most comprehensive showing of those designs, spanning from 1946 to 1973. 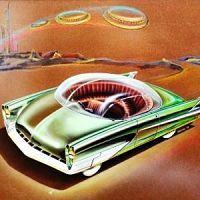 The exhibit, “American Dreaming: Detroit’s Golden Age of Automotive Design,” opened in April, 2015 at Lawrence Technological University in suburban Detroit. Featured in the collection is one of Ostrowski’s early sketches of an AMC Matador that Edwards found for sale in Ann Arbor. Ostrowski, now 77, recognized it immediately, Edwards said. “His exact words were, ‘how the heck did that get out?’” The designs were never meant to leave the studios. Automakers routinely destroyed early sketches for fear they would fall into the wrong hands. But some of them made their way out of Ford, GM and Chrysler, as well as now defunct Studebaker, Packard and AMC. According to one designer, they were smuggled out in boxes with false bottoms. One employee famously hid his sketches inside the liner of his trench coat. “As an artist, you would hate to see your artwork destroyed,” Edwards said.